Green tea white chocolate bark sprinkled with fresh pomegranate seeds. 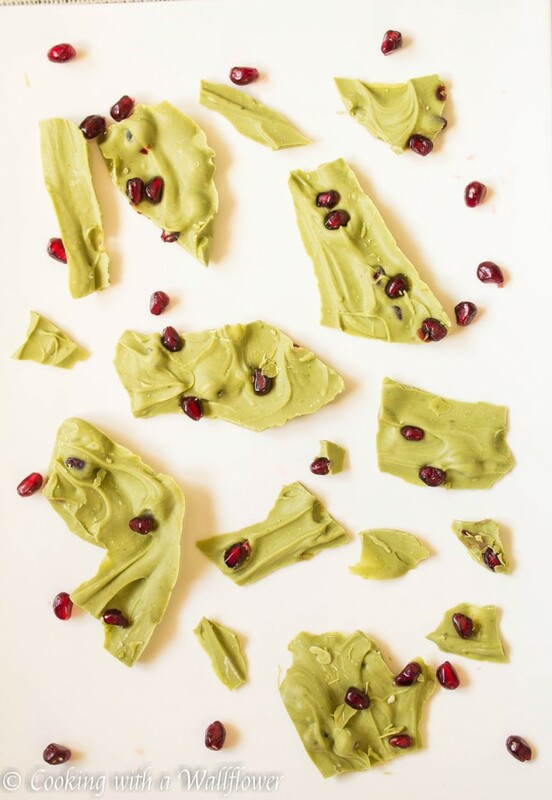 This pomegranate green tea white chocolate bark is the perfect gift for Valentine’s Day or other special occasions. Okay, so I totally know this looks like it belongs in December. With all the greens and reds, it looks like Christmas all over again, doesn’t it? If this bark sounds familiar, you might remember that I messed it up a few times and featured it in my 2015 Recipe Fails. Yes, it was that oily green goop that looked like it was a Play Doh wanna be. But after a few tries, I finally got it to work. How it was so disastrous to begin with is beyond me considering that I’ve made bark a few times before. If you love chocolate bark as much as I do, I think you’ll love this version. The matcha powder which is slightly bitter helps offset the sweetness of white chocolate. 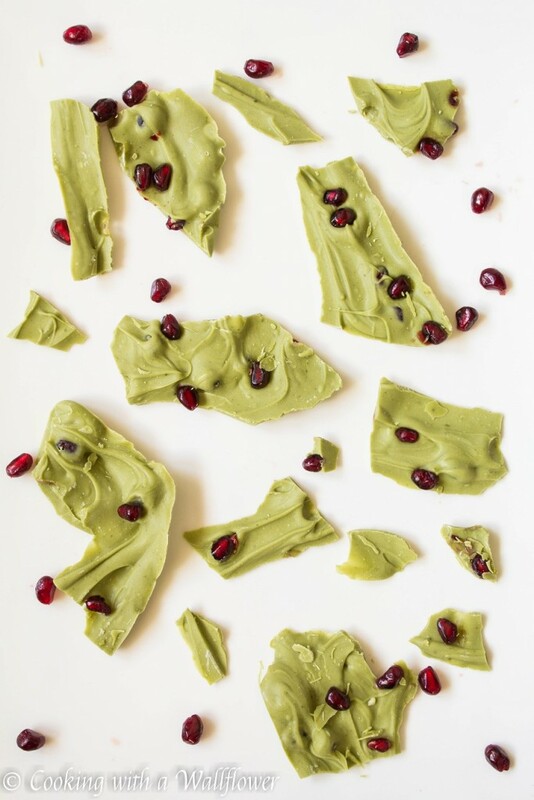 Topped with fresh pomegranate seeds, this pomegranate green tea white chocolate bark is sweet and slightly tart. And it doesn’t even take that long to make. First, place the white chocolate pieces in a microwave safe bowl. You want to use good chocolate, like Baker’s Chocolate, Lindt or Ghirardelli. Don’t use chocolate chips. It won’t work. Melt the white chocolate in the microwave in 30 seconds intervals. Use a spoon to mix the chocolate. Once the white chocolate has melted, mix in the matcha powder. You want to place the matcha powder in a fine sieve or strainer and slowly shake the strainer over the white chocolate. This will help evenly distribute the green tea powder with no clumps. Because I don’t think any of us would like to bite into our chocolates only to taste powder. Use a spoon to mix the matcha powder into the white chocolate. Spread the chocolate onto a parchment paper lined baking sheet. Allow the chocolate to solidify in the fridge for about an hour. Then you can break the bark into pieces. 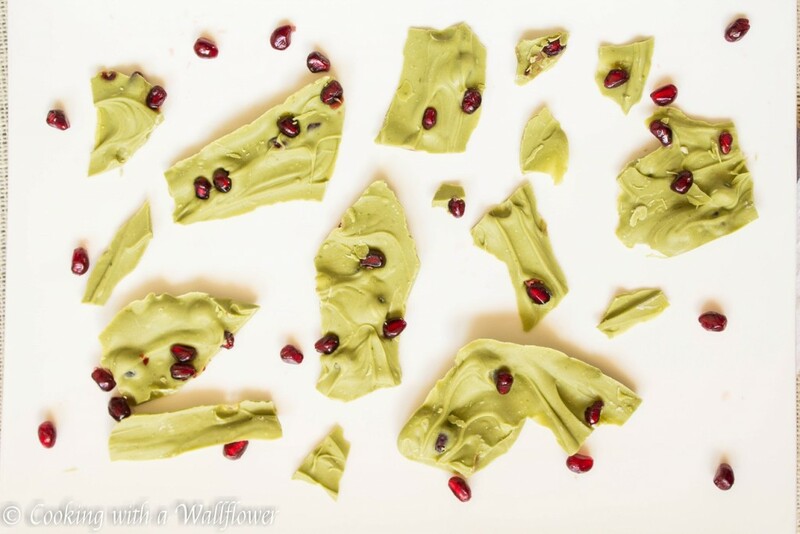 Serve the pomegranate green tea white chocolate bark as dessert or as a snack. Place the white chocolate pieces in a microwave safe bowl. Melt the white chocolate in the microwave in 30 seconds intervals. Use a spoon to mix the chocolate. Once the white chocolate has melted, mix in the matcha powder. Place the matcha powder in a fine sieve or strainer and slowly shake the strainer over the white chocolate. This will help evenly distribute the green tea powder with no clumps. Use a spoon to mix the matcha powder into the white chocolate. This entry was posted in Desserts, Gluten Free, Homemade Gifts, Quick and Easy, Recipes, Snacks, Vegetarian and tagged chocolate bark, dessert, quick and easy, vegetarian. Love the addition of pomegranate to the green tea chocolate bark. 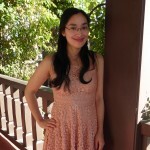 Happy FF, Andrea! As a green tea enthusiast,I can say that this is my dream come true. And white chocolate? Be still,my heart. It is 20 to 2 am and I am still looking at delicious food. Mmm! This would make an excellent Valentine’s day gift! Thanks so much for sharing with us at FF!